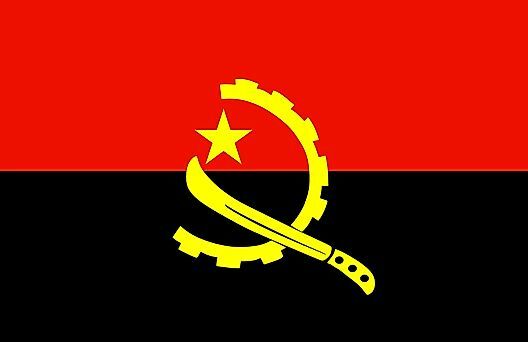 Angola's flag was officially adopted on November 11, 1975. The flag has a horizontally divided field with red over black. A golden star, part of a cog wheel and a machete is centered. That symbol is said to be inspired by the hammer and sickle, and represents industrial and agricultural workers. Yellow is symbolic of the country's mineral wealth, and red and black are said to stand for 'Freedom or Death'. 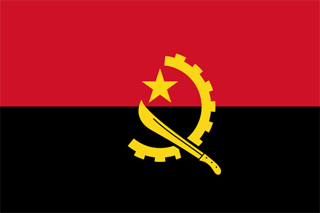 The emblem of Angola was adopted in 1990, and reflects the recent past of the new nation. It features a machete and hoe, symbolizing agricultural workers and the revolution the nation went through to gain independence. The yellow star represents progress, and the rising sun a symbol of new beginnings. Encircling the emblem is half of a cog-wheel, representing industrial workers, and half of a vine for the coffee and cotton industry. 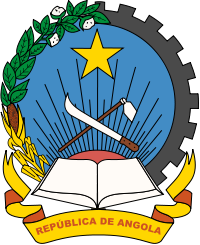 The open book below is a symbol of education, and the banner underneath reads: "Republic of Angola" in Portuguese.